Human imperfection, a sinful world, and a Devil who exists to destroy, are the very reasons you need an anchor for your soul. You need a solid truth to lower at will into the deepest and darkest waters of your life. Something that will never be moved, or allow you to move when the current gets strong. What is higher and stronger than we could ever imagine or ever be? What truth is going to outlast the rest? Who is perfect, faithful, and sure? What anchor provides the stability needed when doubt, discouragement, and failure are constantly shaking you? 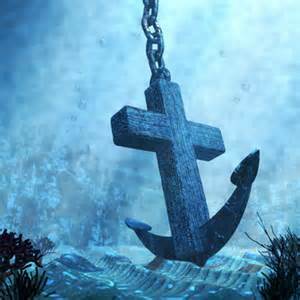 The Anchor is Christ Jesus, and none other will suffice! Sin will beset you at times, sinners will persecute you, and life will explode in your face, but He remains the Author and Finisher of your faith. He is the sure and steady Rock. When Satan reminds you of your sin, your flesh wont relent, and your heart is heavy from not trusting Him, lower the Anchor once more, and let His truth hold you. Jesus perfectly lived, faithfully died, and victoriously rose again. He entered Heaven for you. Before you were born, you were sought out, purchased with blood, forgiven and sealed. You sojourn on Earth, but Heaven is your true home, because Christ is your Lord. He intercedes for you even now, pleading His own precious blood over your mistakes and shortcomings. The Spirit, He is your Comforter. The Father has adopted you and made you His son or daughter. Your sin has been erased, and when you finally see Him, all the tears that this sinful world has caused you, will be no more. Thank you for this. It was good for me this morning. I appreciate the time you take to share with all of us. You’re welcome, Cathi! Please feel free to share with your friends. My heart is to teach and encourage as many as possible. Thanks for your comment!